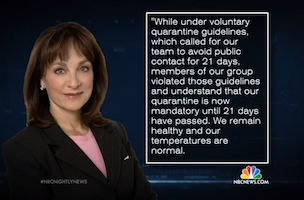 NBC News chief medical correspondent Dr. Nancy Snyderman, who was spotted traveling outside her home in New Jersey last Thursday while under voluntary quarantine, issued an apology Monday evening. The New Jersey Department of Health has since issued a mandatory quarantine for Snyderman and her crew members who briefly worked with the NBC News freelance cameraman Ashoka Mukpo in Monrovia, Liberia, currently being treated for Ebola in Omaha, Neb. While under voluntary quarantine guidelines, which called for our team to avoid public contact for 21 days, members of our group violated those guidelines and understand that our quarantine is now mandatory until 21 days have passed. We remain healthy and our temperatures are normal.